There is a nice selection of AU and MS examples for this die marriage, with a couple MS66's at the top. This one seems to appear more often than the O-105 and also has more higher grade examples available. 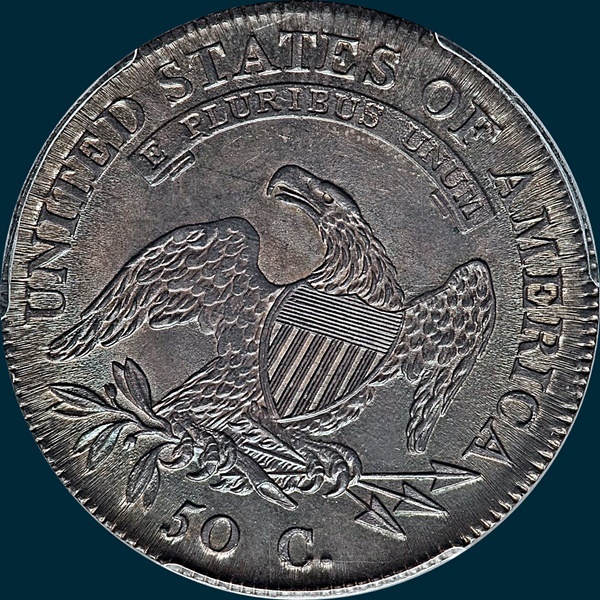 There is also an example in a PCGS holder (AU50) with the XXXX designation, where this die marriage is said to generally not have the XXXX designation. The 1809 O-106, R3 die marriage and its sub-varities. Regarding die cracks on this die marriage, the Overton/Parsley book states that on the obverse "Most specimens show a die crack joining all stars on (the) left." No die crack is mentioned to be on the reverse. This die marriage was struck using obverse die 8 and reverse die E. These dies were only used on this die marriage because the dies broke up during the striking of this coin. (b) A die crack through the stars on the left. (c) The die crack through the left stars is heavier and a die crack appears on the reverse from D to ST.
(d) Same as (c) above with a die cud appearing at the bust. This list explains why Overton used the word "most" in the die crack description in his book. A survey of how many specimens exist of each die state would surely be impossible to under take. 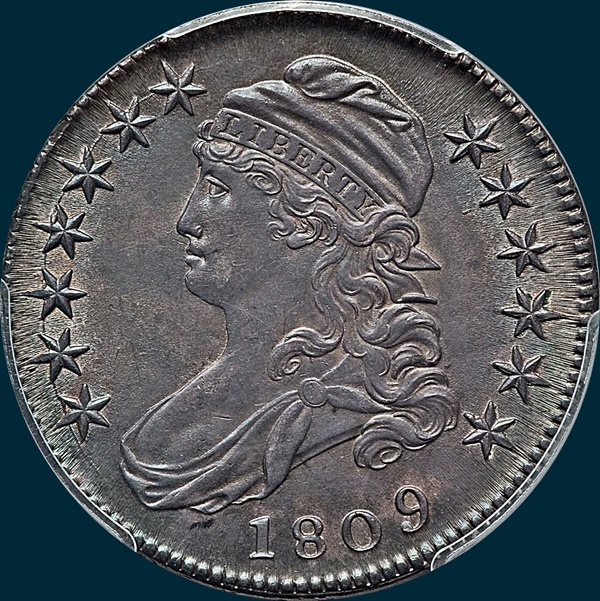 If you own an 1809 O-106 you might want to take another look at your coin. What stage of die break up were the dies in when your coin was struck? The example below is the "C" model. Variety Attribution: Obverse-Date is 9 1/2 mm. 18 is wider than 809 and 9 leans sharply to the right. Ball of 9 is 1 1/4 mm. from 0. Most specimens show a die crack joining all stars on left. Reverse- 5- C. is 2 1/4 mm. Arrow to A is 1/2 mm. Center dot between crossbars 4 and 5.. A straight die line extends upward for 3 mm. from corner of shield into right wing. Longer and straighter than the one on reverse B (O-103), although this one may not show on worn specimens. N is recut at left stand. I is centered below T.